Today's post is about the recipe for this easy ground turkey stroganoff... a.k.a. crazy good comfort food. This is one of those dishes that is super simple yet super yummy and we rarely have leftovers to package up when I make it. Those are all fantastic qualities in a recipe, if you ask me, especially on busy weeknights! This dish is a semi-homemade meal that my family loves, and I do use a can of condensed cream of mushroom soup in this recipe. I know some people get a bit down on that, and I could very well make my own creamy sauce, but sometimes those old-school flavors that only come from using condensed soups just make me happy! Also, I use ground turkey most often when I make this for dinner because we always have a pound or two of it readily available in our fridge. But, really you could use cubed turkey breast, cubed chicken breast, cubes of beef sirloin or any other cut of meat that floats your boat in this recipe, if you're not a fan of ground meat. It didn't make it into the photograph, but there was a nice, fluffy bowl of fresh, steamed broccoli on the table just waiting to be served along with this quick and easy supper. 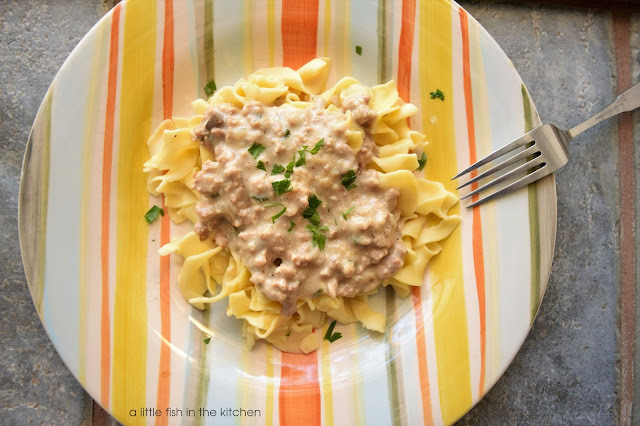 A good steamed veggie or a nice, crisp green salad goes along great with this easy, rich ground turkey stroganoff. I'll just add here that I found this soft-textured dish really difficult to photograph! So, scroll on down to the ingredients list if the pictures don't convince you that this family-friendly dinner is worth trying because it's definitely some tasty stuff. 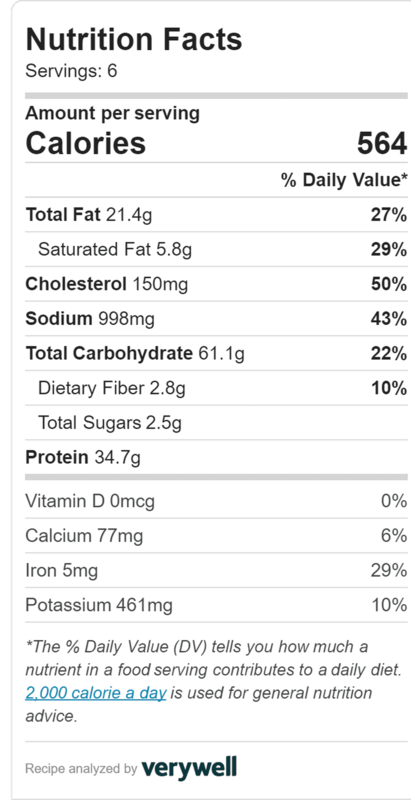 Lately, I've been using the free nutritional analysis provided by VeryWell.com for myself and I'm enjoying it... alot. I thought it might be handy to include these free nutritional labels for some of my recipes for you all to reference too. Let me know what you think?! 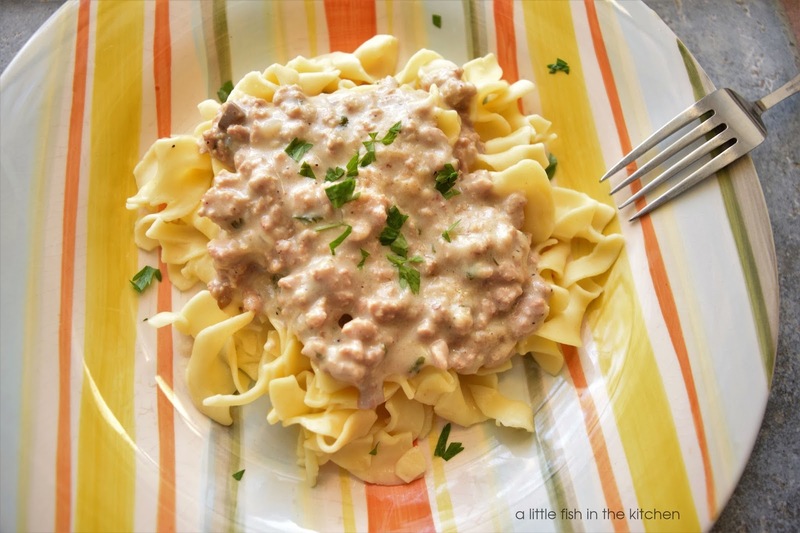 This recipe was adapted from Paula Deen's recipe for beef stroganoff. 1. Cook eggs noodles according to package directions, drain and set them aside. Add butter and turkey to a Dutch over or large skillet and begin to brown. Once meat starts to have a little color, drain the ground turkey and return it to the pot. Season with salt and pepper and add the onions, mushrooms and parsley to the pot. Saute until meat is cooked through and veggies are tender. 2. Add the flour to the pot and stir until it is absorbed by the meat/veg mixture. Add the mushroom soup and beef broth the the pot and stir until it is well combined. Cover and allow to simmer, stirring occasionally for 15-20 minutes. Turn off the heat and stir in the sour cream. 3. Serve over cooked egg noodles and enjoy! Don't forget to follow me by email so you never miss a post! Looks super comforting and yummy! I love that turkey stragonanoff sauce. Stroganoff made with anything is good stuff! Never had it with turkey, but really like the idea. Fun dish -- thanks. Comfort food like this is irreplaceable- who cares if it has a can of soup? i've been thinking about making stroganoff quite often lately! my mom always used cream of mushroom soup, so i do too--not a thing wrong with it! love your lighter version!